Escape the Winter Blues with a Short Break to Dubai. During the months of January and February the average daily temperature in a rainy London and other cities of northern Europe hovers around 7°C. Meanwhile just seven hours away in the United Arab Emirates it’s more like 25°C with hardly any rain. No wonder Dubai has become a major winter holiday destination which expects to be welcoming 20 million visitors per year by 2020. In spite of there being air-conditioning almost everywhere (including the bus stops) summer temperatures are pretty much unbearable with daily averages around 40°C. Therefore, the perfect time to visit Dubai is between the months of November and March when temperatures are hot but bearable. With around 85 million passengers per year, Dubai International Airport is the busiest in the world in terms of international passengers. Located 20km north-east of the city’s Jumeirah Beach the airport serves as the home base for Emirates which offers thousands of weekly flights to Dubai from cities all over the world. Almost 150 airlines offer flights to Dubai including daily services from London, Manchester, Frankfurt, Paris and Amsterdam. private transfer from Dubai Airport. Shuttledirect offer private transport services with a personal driver as well as more economical shared shuttle transfers into the city. Dubai Creek: This waterway dissects the traditional areas of Deira to the north and Bur Dubai to the south. It is home to most of the city’s historic attractions and offers a range of affordable accommodation. Downtown Dubai: This is the central area surrounding Burj Khalifa (the world’s tallest building) which is home to the enormous Dubai Mall shopping complex. There is plenty accommodation here and along Sheikh Zayed Road to the south-west but properties tend to be mainly business orientated and are fairly expensive. Al Barsha: This apartment focused district lies some 15km south-west of the downtown area along Sheikh Zayed Road. Located around the Mall of the Emirates it is a little far out for many visitors although there are good transport links and some excellent apartment rental deals available. Jumeirah Beach and Beyond: Standing on the beach overlooking the Persian Gulf this is one of the most popular areas for winter holiday accommodation. 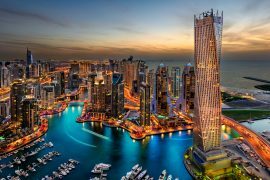 It stretches for around 20km along the coast from just south of Dubai Creek as far as the affluent district surrounding Dubai Marina. Prices in this area tend to be amongst the highest in town and especially at hotels which have their own private beach. 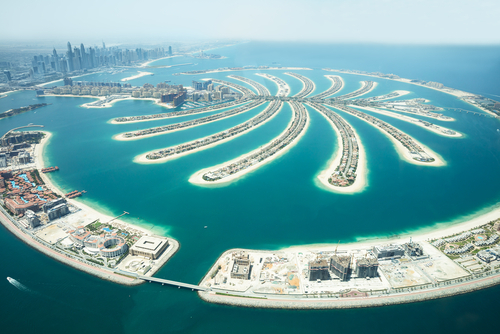 Palm Jumeirah: The Palm is a man-made island which has been constructed off the coast of Dubai in the shape of a palm tree. Other similar projects remain under construction. Holiday accommodation prices here are also amongst the most expensive in a selection of luxury hotels, private resorts and upmarket villas. 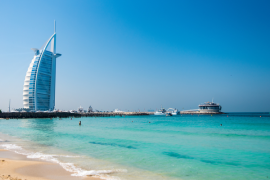 Burj Al Arab Jumeirah (Jumeirah Beach Road): This self-proclaimed 7-star hotel is one of the world’s most prestigious places to stay which is an iconic feature of the Dubai skyline thanks to its sail-shaped design. Atlantis The Palm Hotel (Palm Jumeirah): This 5-star property on the man-made island of Palm Jumeirah is another of Dubai’s best-known hotels in the luxury category. Themed around the ‘Lost City of Atlantis’ it has its own beach, 23 restaurants and first-class amenities throughout. The Oberoi Dubai (Al A’amal Street): More affordable than the previous options, this luxury 5-star hotel located just a short distance to the south-west of downtown Dubai offers uninterrupted views of Burj Khalifa. Alcohol Warning: Don’t forget that the UAE is a Muslim country and there are strict laws on alcohol consumption. In Dubai it is legal to drink alcohol in certain licensed places such as hotels, resorts, bars, restaurants and clubs, however, it is illegal to be under the influence of alcohol in public. If you enjoy a drink you’d be advised to stay in a hotel which has its own licensed bar. Sheraton Jumeirah Beach Resort (Al Sufouh Road): With its own private beach and beautiful swimming pool in the Dubai Marina area of town this is another 5-star property which is in high demand during the winter months. Its ‘Kids’ Club’ has made it a popular choice for families. Hilton Dubai Jumeirah (The Walk Street): Located nearby in the Marina neighbourhood this is yet another luxury option which has its own private beach and swimming pool within its landscaped gardens. Arabian Park Hotel (Al Jadaf Street): For a simple, budget option which is clean and friendly, this 3-star property located in the Bur Dubai is worth considering. It is well-positioned for cultural sightseeing and provides shuttle buses to the beach. 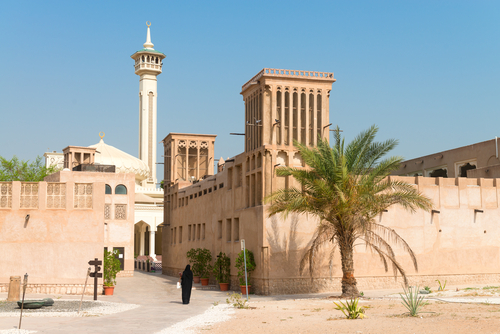 Discover the Historic Bastakiya Quarter: Located south of Dubai Creek in the historic Bur Dubai district this cultural quarter has been restored to show how Old Dubai would have been in the mid-19th century. It is home to a number of tea houses, art galleries and attractive cafés Nearby attractions include the Dubai Museum, Sheikh Mohammed Centre for Cultural Understanding, the Grand Mosque and the Textile Souk. 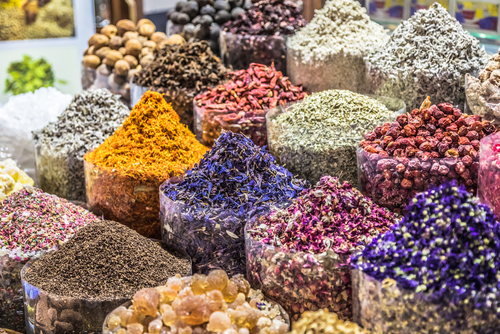 Haggle Your Way Around the Historic Souks: On the other side of the Dubai Creek from Bur Dubai lies Deira which is one of the busiest areas of the city. It is home to a network of narrow streets where the city’s historic Spice and Gold Souks are located. A fun way to get there is to climb aboard one of the many traditional wooden abra boats which ferry passengers back and to across the waterway. Getting Around: First time visitors to the city will enjoy the hop-on, hop-off tourist bus (Big Bus Dubai) which offers three different sightseeing itineraries covering all the main attractions. There’s also an excellent metro and bus service for getting around. 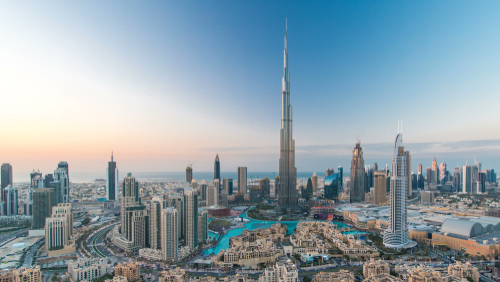 Ascend the World’s Tallest Building: Standing at 830m the iconic Burj Khalifa is synonymous with the skyline of Dubai. Visitors can take a lift which takes less than a minute to reach the 125th floor. You can then walk down to the observation deck on the floor below and watch the musical Dubai fountain show far below. There is another ‘At the Top’ ticket which takes visitors to the 148th floor but the added expense of doing so is hardly worthwhile. 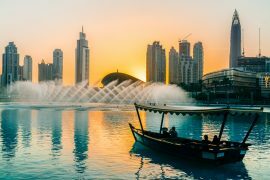 Enjoy Some Retail Therapy in Dubai’s Shopping Malls: With literally hundreds of shopping malls spread around the city, Dubai is a popular destination for shopaholics. Whilst many of these malls are of little interest to international visitors others have become major tourist attractions. Probably the best-known one is the Dubai Mall which stands below the Burj Khalifa. It houses more than 1300 shops and 200 restaurants as well as being home to the Dubai Aquarium and an Olympic-size ice skating rink. Experience a Winter Wonderland: If it’s too hot outside and you find yourself yearning for more of a traditional winter holiday then head down to Ski Dubai. Located within the premises of the enormous Mall of the Emirates this winter-themed playground is one of the world’s largest indoor ski resorts. In addition to its five ski slopes there are also options to try many other activities including bobsledding and tobogganing. 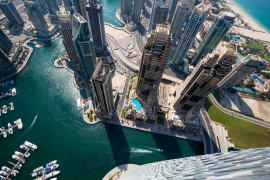 Dine at the Dubai Marina: A fine selection of chefs from around the world have relocated to Dubai where the vibrant restaurant scene creates an endless demand for new and exotic flavours. Highly recommended is Pier 7 at Marina Mall which is a ‘culinary tower’ overlooking the Dubai Marina where diners can choose from any one of seven gourmet restaurants, one on each floor of the building. These eateries include Arabian cuisine at Abd el Wahab, the Latin flavours of O Cacti and British pub classics served at The Scene which is run by celebrity chef Simon Rimmer.